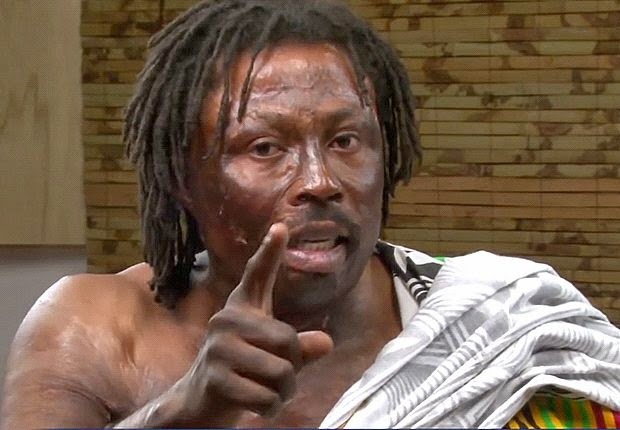 Ghana’s most influential witch doctor has claimed he is responsible for the knee injury that is threatening to Cristiano Ronaldo’s participation at the World Cup. Nana Kwaku Bonsam – whose name translates literally as “Devil of Wednesday” – predicted in February that the Real Madrid forward would be forced to miss this summer’s tournament in Brazil with injury. A statement from the Portuguese FA on Wednesday confirmed that Ronaldo is suffering from tendinosis in his left knee as well as nursing a muscle problem in his left thigh, which caused him to miss the 0-0 draw with Greece at the weekend. Ghana are set to meet Portugal in their final match of Group G in Brasilia on 26 June and Bonsam claims to have conjured a special powder from his gods, mixed with several leaves and concoctions which have been placed around an image and caricature of the former Manchester United player. “I know what Cristiano Ronaldo’s injury is about, I’m working on him,” Bonsam, who serves at the Kofioo Kofi shrine, said in an interview with the Kumasi-based Angel FM. “I said it four months ago that I will work on Cristiano Ronaldo seriously and rule him out of the World up or at least prevent him from playing against Ghana and the best thing I can do is to keep him out through injury. “This injury can never be cured by any medic, they can never see what is causing the injury because it is spiritual. We can only hope those poor dogs were not harmed. As Ronaldo, it's probably safe to assume that he will return to training ahead of the tournament and turn in a virtuoso performance against Ghana to help Portugal advance out of the proverbial 'Group of Death' at the expense of the Black Stars. I'm sure many Swedes were hoping, if not praying, for Ronaldo to incur some sort of ill luck prior to World Cup play-off match. Look how that turned out. LISBON, Portugal - Portugal says forward Cristiano Ronaldo has patellar tendinitis in his left leg to go with a left leg muscle injury as the team prepares for its World Cup opener on June 16 against Germany. The Portuguese Football Federation also says in a medical report that Pepe, midfielder Raul Meireles and goalkeeper Beto all trained separately on Tuesday as they recover from injuries. Ronaldo, the world player of the year, helped Madrid win the Champions League last month despite being hampered by leg injuries late in the season. Portugal is in the United States, where it will play Mexico on Friday and Ireland next week in friendlies before heading to Brazil. At the World Cup, Portugal also plays the United States and Ghana in Group G.